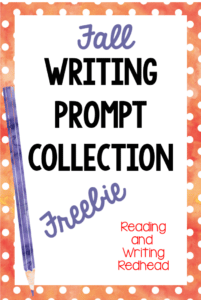 Reading and Writing Redhead: Fall Writing Prompt Freebie! I know some of you have actually started back to school ALREADY and are thinking fall. I have 5 weeks left but I am still thinking: How do I get my students engaged in writing this fall? Well, I created this writing prompt to help! You can download this writing prompt with a seasonal theme! This Fall Writing Prompt Freebie includes a prompt in which students have to explain if they'd rather live somewhere where it is warm all year or if they'd prefer to live somewhere where weather changes with the seasons and why. There is also a checklist for student accountability and a few different types of writing paper included. Grab it by clicking on the image below or here. Enjoy, and if you decide to grab this freebie, I'd be so appreciative if you take a moment to leave some feedback. Thank you so much!